It's tough to look straight ahead when we really don't know where we're going...although we may have an idea where we are being led. And to me this is where FAITH comes in, SOMEONE "holding me by the hand" and leading me the way. Long term goals? Sometimes our own goals do not work out . Why have them? I do agree with Mike about setting short term ones and staying flexible...and being open to what is! I think that's pretty much what my life has been for all those years. Did I ever plan on any of these? I don't think so--- who would ever think I'd end up here in NY from a simple rural community back home. Where to next? Only God knows... He opens the door for us, it is up to us to respond knowing that it is the right time, the right place... and His PRESENCE will always be there! I was in prayer once and asked God for direction in my life. Often times I get one word answers to my prayers. This time what I felt God lead me to was to set goals. I know that had to come from Him because He always has the best options and they are usually options I don't think of myself. I have made goals and usually follow through and complete them with the help of the Lord. One verse comes to mind in Psalm 27:11 Teach me your way, O lord: lead me in a straight path because of my oppressors. One of my biggest oppressors is my self and my self doubt, especially when it comes to confidence. I am still trying to figure out what God really wants from me and what I am really going to "be" when I grow up. The problem is my life is already half over as 50 is not too far around the corner. Thank God we have the the Lord in our life to lean on. I was skimming through proverbs today in my application study bible and found something on diligence and laziness. Proverbs makes it clear that diligence-being willing to work hard and do one's best at any job given to him or her is a vital part of wise living. We work hard not to become rich, famous,or admired (although those may be by products),but to serve God with our very best during our lives. I think I needed to read that today. Have a blessed and wonderfull day everyone. goals are just steps that can be measured as progress toward the objective - failure or success can be a communication or conviction with God on your direction. Because I live in Australia I do the reading assignment earlier than many of you and get to read comments after I have done mine. I have realized that many of us share similar comments and reflections and this indicates that we confirm and edify one another in our core beliefs. We have been guided by the Spirit and will know the truth from the false. Joseph looked like the Egyptians,not too sure if they didn't look down a bit on his background but they needed him so he had to be accepted.Joseph was proud of where he came from,he lived in Egypt but his eyes were set on God.He may have done a few things wrong like practise divinity,but a friend once told me,you'll never reach God's standard here on earth....you'll still be influenced a bit by the sinful nature of the world,you'll still be striving for perfection without ever really getting there but God will still love you. Joseph,did save the remnant of Egypt,in spite of being far from God's people and God's ways....God was still never far from his mind...and never left his heart. Just recently one family at the church that I go to are going to give me their really good bunk beds as they are going to upgrade. They know I could use them. I was given $$ at Christmas time to help pay for our dinner again another blessing. Discernment a friend and I were just talking about this the other day and she too said one of the ways to know what is truth and what is not is by reading the bible. 2If the sky is red in the evening, you say the weather will be good. 3But if the sky is red and gloomy in the morning, you say it is going to rain. 25Keep looking straight ahead, without turning aside. 26Know where you are headed, and you will stay on solid ground. 27Don't make a mistake by turning to the right or the left. Keep your eyes focus upon Jesus and the light at the end of the tunnel of life. When thinking about a goal it could be to keep up our Christain walk so that we can be asured of one day going home to live with Jesus in Heaven. Mike, I believe goal setting is a wonderful tool for keeping our minds set and our hearts undivided. Your propensity to set goals will largely depend on your personality type. I am a driver and therefore love setting goals AND thrive on the satisfaction of reaching goals. I have a friend who is an Expressive and hates goals. Thank you for pointing out v25-26. I have made note of them to add to my scripture memorization. God bless you as I have really enjoyed this journey so far! 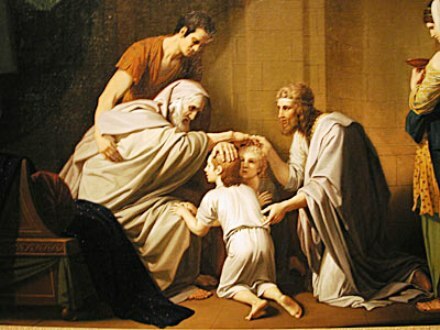 Genesis 49:5 Jacob gives blessings to Simeon & Levi. 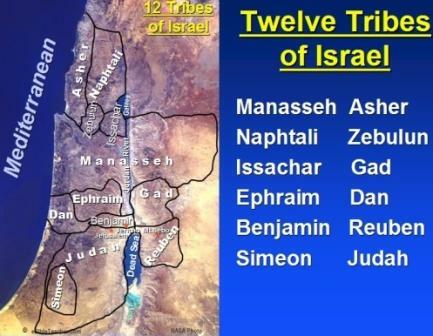 The map does not show Levi and I believe his descendants became the priests. When did this happen? I believe goal-setting is absolutely critical. Without setting goals, it's too easy to wander through life without a focus on the things that are important. In the past, I've been good about goal-setting in particular areas, like saving money or contributing to a ministry. But this year I took it a step further. To some people, this kind of planning and goal-setting may seem off-the-charts. But think about it ... how busy is life these days? How many distractions are there? Each week, I review my list of goals and note where I have, and haven't, made progress. I then use my goal spreadsheet as a foundation for prayer, thanking God for my triumphs and asking for help with my shortcomings. I think God wants us to live deliberately ... focusing on certain things, and avoiding others. With a goal-based system like this, I can live deliberately, and spend my time more productively for Him. Lesley, great idea. Thanks for the tip. Oh, Lesley. I hope that this is not off the wall but would you mind sharing your spreadsheet? Let me know. Thanks! Last year, I wondered why a repeat of basically the same story as the feeding of 5,000. I beleive the answer is in the crowds Jesus was feeding. Some say the lesson was different - 5,000 to rely on the Lord, 4,000 to have compassion for the people. Maybe. What is known is: the first crowd was made up of Jewish people. The second crowd was in the Decapolis region (Gentiles). To me the overall lesson is keyed by the leftover baskets. In the first instance - there were twelve. In the second - seven. The 5,000 were in a remote place and hungry - perhaps symbolizing spiritual emptiness in Israel at the time. Jesus, the bread of life, provided that food for them and more. Jesus can provide for the Jews what they need and more. The twelve baskets of leftover scraps representing the twelve tribes of Israel. God's grace and provision is overflowing for the nation of Israel. So what about the 4,000? Jesus had compassion for both crowds, but anytime "three days" is mentioned I think of the Resurrection. Perhaps this is a foreshadowing of the crucifixion. The cross is not enough - the ressurection makes it complete. Without the ressurection, we would just be a bunch of forgiven sinners running around, but still not filled. Jesus, the bread of life, provided that fulfilment with the Resurrection. When we take in (receive) Jesus, we will no longer be (spiritually) hungry. Does this mean since Israel rejected Christ that this story indicates salvation is only for the Gentile? Note: Last night as I was going to bed - it struck me that most of the world teaches there are seven continents. So, perhaps, the seven baskets can be viewed as representing the continents. Again, God's salvation is for the whole world. I think Bob Deffingbaugh's commentaries are good, and if you have time should be read at the links Mike provided above in his comments. 1)Going to come back to these blessings as events unfold in Israel later in OT. "Then Jacob called for his sons and said: "Gather around so I can tell you what will happen to you in days to come." "days to come" is "last days" (KJV). It is the same Hebrew word used by Isaiah and Micah when referring to "end times". So the whole stroy has not unfolded yet regarding these blessings. 3) Joseph ends up with the birthright blessing - a double portion through his sons. 4) Judah is the royal line from which Jesus is born. Why Judah? I believe it is because he is the one son who repented and submitted himself (offering himself) taking responsibility for the safety of Benjamin on the second trip to Egypt. 5) The importance of the father's blessings. Bob Deffingbaugh explains this pretty well. It struck me, that as adopted children of God how much more so we should lean on and heed the (spiritual) blessings that our Father has bestowed on us. "that everyone who believes in him may have eternal life." And continues through the rest of the New Testament. Salvation is not the end of the journey - it is the beginning. God has purposes and plans for us that are embedded in his spiritual promises to us. Eternal life does not begin in heaven, but begins when we are one with Christ. Proverbs 4:20-27 really spoke to me today. Once again I have been reminded that no matter what I need to keep my eyes fixed on the Lord. It is easy to forget that sometimes and lose sight of him. I have to remind myself of this daily because it is so, so easy to get caught up in the things of this world. Getting caught up in gossip and people's drama, etc. I am so amazed at how much people gossip in the church and try to use prayer as a way to be able to tell others peoples business (if that makes sense). I was so disappointed when I realized this. Mike, your insight on vs 24 was great.My struggle is to learn how to get out of these conversations gracefully and not seem rude. "Guard our hearts because it determines the course of our lives" I thought that this verse was awesome. I ask God to check my heart everyday because I see how important it is to have a clean (right) heart. Our hearts detemine a lot of our actions and even the words that we speak. I know that somewhere in Matthew it says that out of the abundance of the heart the mouth speaks. When I start speaking crazy things I check my heart. Anyway, proverbs said a lot of different things to me today. I read the Psalm first today; what a beautiful benediction! Then, in reading Genesis it struck me that what we prophesy to our children (e.g. you're a "bad boy" they believe and attempt to fulfill ); as I read the blessings of Jacob to his children I could see how many of them were fulfilled. Conversely, when we prophesy good things to our children, they try to live up to THAT! And finally I was surprised to see that Leah, the one who consistently sought Jacob's love and favor was buried with the patriarchs and their wives, and Rachel was buried elsewhere. Just a few thoughts that went through my brain in today's reading. May we all recognize our many blessings! Jen, My family too would say many things that I did not know until later came from the Bible. As I listened to the state of the union address last night President Bush said, "To whom much is given, much is required." I know this comes from the Bible but I wonder how many of the people listening last night know that. I use to wonder why God did not "speak" to me-I thought I had to hear Him out loud, person to person. One day I did hear Him speak to me, out loud, 2 words, "Be Patient!" And in hearing that I suddenly realized that He speaks to me everyday in a million small ways and I have learned(and am still learning)to listen for the "still small voice" which may only be in my heart, or what I see, or what I read, or what I hear, or even how I feel. I am continuously blessed by my family, friends, a few coworkers and my church family. When I was a child my grandmother would say " Bless your heart" to me whenever I pleased her. Now I say it to my friends and family hoping that it may mean as much to them as it did to me when I was young. When my sons were Boy scouts they were told to always leave a place better than they found it. I want to try to leave my coworkers, friends, clients, at the end of the day feeling better than they did at the start. That is what Jesus does for us if we ask Him. When we pray to Him, He will leave us feeling better at the Amen, than when we started-When I am finished praying sometimes I am in tears of joy knowing I have a savior who loves me.Me! I am nothing!, but with Him I am everything!!! Pv. 29:18 Where there is no vision the people perish. I believe in goals big and small. I encourage everyone in my family to set goals, tend them, review them, alter them if they no longer fit. I am not afraid of goals, even if I fail; it is a way to move forward and acheive things. There are many kinds of goals: family, household, professional, academic, spiritual. This year, my family is working on a goal wiki. We all contribute stated goals and comment on each other's goals. I'm a goalsetter, but not writing them down. I keep them in my head & heart. Before I was married, I was a huge goalsetter, writing them down and I would do anything to achieve them. It didn't make me a nice person; it made me a neurotic controllfreak and too competitive. When I met my husband I had to take a step back and be a 'healthy goalsetter', I had to get rid of my neurotic and competitive side, in order not to loose this guy! Most of my goals now are pretty 'regular close to home'-goals. For example: live my life like a Christian, follow God's word, being a good mother etc ... There a couple of other goals I have, wich I like to keep for myself, but I'm not sure if I can ever achieve those. I'll try to ... I know it's not the time yet, so maybe in the future? Psalm 20:5 stood out for me "May we shout for joy when we hear of your victory, flying banners to honor our God. May the LORD answer all your prayers." ~ Makes me think about next Saturday and look forward to it even more!!! I'm going to spread the Word again with a couple of brothers and sisters. This time we go to Amsterdam ... that's a real challenge. Knowing that Amsterdam is the center of extremes! A family from our church went to Amsterdam to pioneer. So were going to spread the Word to get people to their church. I'm excited about it! 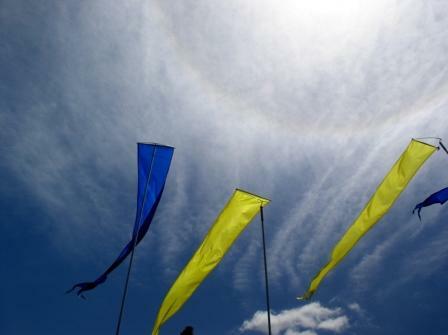 'Flying banners to honor our God!!!!!!!!!!!!!!!!!!!!!!'. 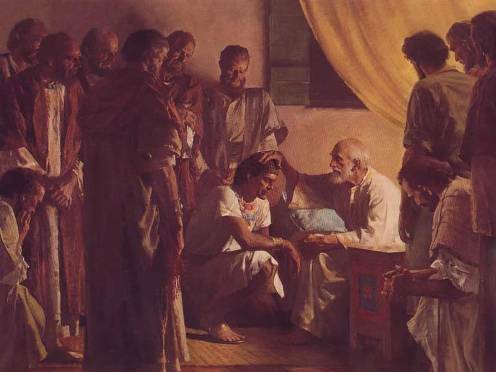 It is amazing to read about Jacob blessing his children. At the church I grew up in when a person accepted Christ and was baptized, the senior pastor pronounced a blessing for each person. As a teen, I was honored to be blessed, and found it important to live up to that blessing. I am thankful for this profile and appreciate having these blogs to read. Keep up the good job. May you be blessed in everything your hand touches. The Lord fill your family and your life with joy and peace. May God's love abound to you all. May God's salvation come to all those in your household, your friendships, and those to whom you reach out. May you have the boldness and wisdom to spread the Good News to the lost and lead thousands upon thousands to Him. God bless you spiritually, physically, socially, mentally and financially. Amen. I believe God definately wants us to have goals, aspirations..but many times our goals dont work the way we plan. We have to be flexible in this, planning and considering IF it's God's will then this is what i'd like to accomplish. God calls us to be hard workers and definately keeping ourselves busy about our Father's business. i dont really write them down, but i have them in my heart, but they are written in pencil ;). God may have something else in store for me, many times He does! So we need to keep in mind He will direct our paths if we trust in Him and ackowledge Him in all our ways. Goals to me are a way to organize and focus, have a structure/order and God is a God of order and structure. we cant lose heart if our plans dont pan out, God has far greater things in store for us! i can be spontaneous in some regards, but in others, i have goals n if God gives me that peace, to stay on that path, i stick to it. Its perserverence and determination and God doesnt want us to bum around, waiting for Him to drop food in our mouths. Like Joseph...God warned Him about the famine, so Joseph planned and prapared n was ready when it came. Like Noah, he set out to build an ark, and he was prepared wen the time came. Whether it be a godly goal or a goal such as getting through college, getting a job, losing weight, getting in shape, whatever it is we have something to work for and thats good. But we still must put God first...not my will but Yours be done!